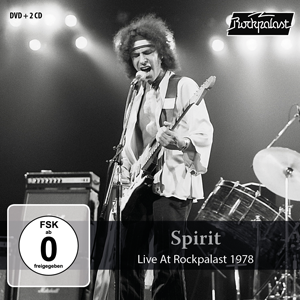 SPIRIT’s concert, a Rockpalast Eurovision broadcast in March 1978, turned out to be one of the highlights of the first Rockpalast series (1977 to 1986). Randy California’s guitar style was strongly influenced by Jimi Hendrix, in whose band he had played in the tender age of 15. He performed HENDRIX’ versions of the DYLAN numbers “Like A Rolling Stone” and “All Along The Watchtower”, adding an imposing bass foundation with his Moog synthesizer, which he operated like the foot pedal of an organ. Randy’s stepfather ED CASSIDY’s drum set-up was impressive and included – like a classical orchestra – two timpani. His drum solos were considered highlights of the concert. Larry “Fuzzy” Knight completed the power trio. Towards the end of the show DICKEY BETTS entered the stage again to jam with SPIRIT. His melodious southern rock guitar presented a striking contrast with RANDY CALIFORNIA’s tougher guitar style. Total DVD: approx. 113 Min.